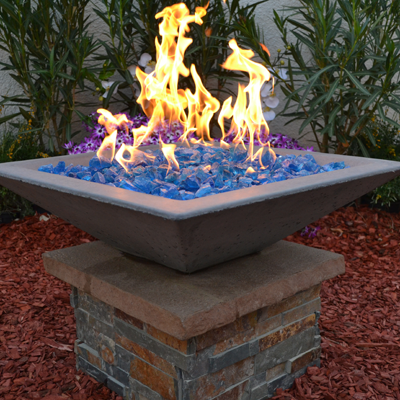 Outdoor Concrete Fire Bowls - Large selection in a variety of sizes and styles. 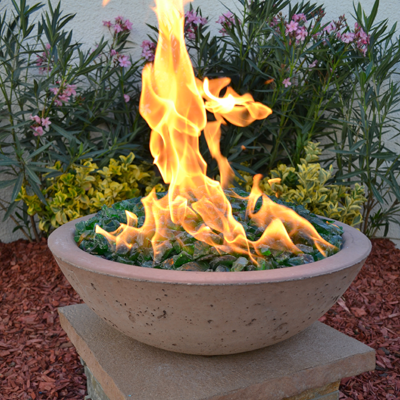 All fire bowls are constructed with fiber reinforcement, water sealer and colorant thought the mix. All Bowls come with a 1 1/2'' Hole core ready for installation. Concrete Fire Bowls are the perfect starting point that will add Dazzle and Style to your landscape design enjoy the blaze and warm glow of our Fire Features. 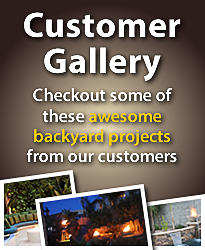 When it comes to quality, Backyard Blaze offers you, world-class quality products and customer service. You might be asking your self These look great what do I need to do to get one installed?. 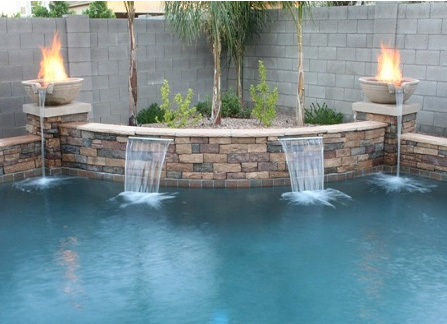 First decide what size of a bowl you need, type ie scupper for pools - non scupper for no water designs. Would you like to be able to flip a switch and have it turn on, or save money and go the manual light option. Choose your decorative glass, or type of filler, then order the bowls you need. Once they arrive you can contact a landscaping or design firm to build out the design, you will need to hire the local gas company to run a gas line to it. Then invite all your friends over and enjoy! If you have any questions please feel free to contact our sales staff. They can even help you find the right contractors in your area, or answer any questions you may have. 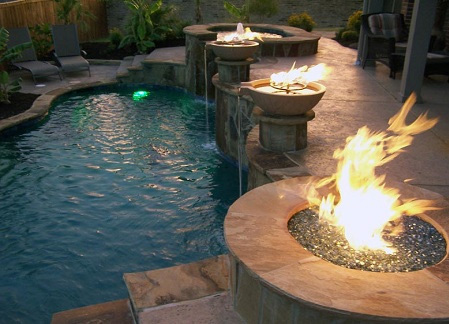 Outdoor Concrete Fire Bowls are the foundation to creating a classy Fire Feature. Add fire glass, rocks, cannon balls, even water. This product works great as a replacement of standard lava rock. 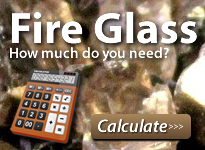 Whether you want to use Fire Glass for your inside fireplace or your Outside Fire Pit, Backyard Blaze’s Fire Glass will enhance any fire feature you use it with. You will not need to worry about any harmful and toxic material emitting from this Fire Glass. 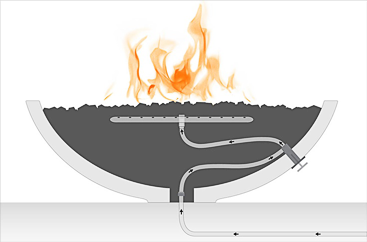 No dangerous chemicals are used in the production of our Fire Glass. You will not be annoyed with bitter smells either and receive up to 5 times more radiant heat than a standard fireplace. Backyard Blaze keeps your safety in mind. You can choose from a huge collection of colors and sizes to match the other decorative pieces of your fire features. Or you can also customize the color combination yourself and get some help from Backyard Blaze friendly staff.